Gretchen Brinza sports earrings with the chemical diagram for caffeine, made with a 3-D printer. LINCOLN PARK — Gretchen Brinza wears earrings with the chemical diagram for caffeine. 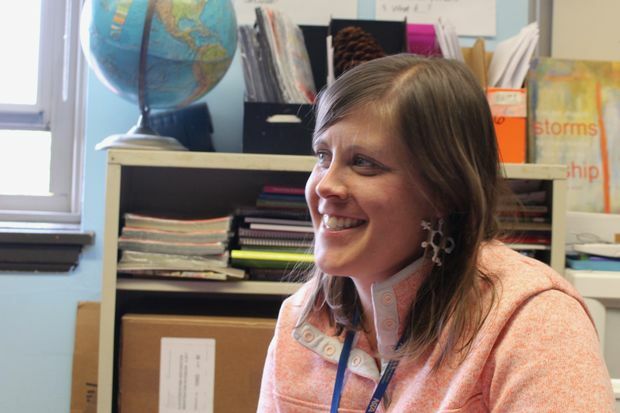 What else do you need to know about the Alcott Elementary science teacher? Well, how about that she was just named the top STEM educator in the state for teachers in kindergarten through fifth grade? Brinza is the fifth- and sixth-grade science teacher at Alcott, 2625 N. Orchard St. But integrative learning is the order of the day, and Brinza heartily endorses that. While she grants that "math is the language of science," she emphasizes that the overlap is not just in the areas of science, technology, engineering and math. "It's really thoughtfully integrating the disciplines," Brinza said Tuesday, after claiming her 2017 Illinois STEM Educator Award last week in DeKalb, an honor bestowed by the Illinois Science Teachers Association, the Illinois Council of Teachers of Mathematics and the independent ETA hand2mind agency. Brinza pointed to the way people learn in the real world and emphasized how the old education method of separating everything into different areas was unnatural. "We all use critical skills in the work we do and we all use science in what we do," she said. "And I try to have students understand the STEM disciplines are literally everywhere in our lives. "I love when a student comes to me and says, 'Hey, Ms. Brinza, look what I found in the real world that is related to what we're doing in class,'" she added. It's not just the interrelationship between those fields. Brinza cited how students are studying the qualities of light in science class, at the same time her language-arts colleague is teaching the students about theater and drama, and they're putting those together to study how light illustrates mood, theme and direction onstage. "They're beyond pumped about the project," Brinza said. "When they become invested in something, there's so much more that can happen." That approach earned her the top spot in the state this year with the award, after she was one of about a dozen finalists for it last year. The judging committee recognized Brinza for originality of activities, incorporation of engineering principals, integration of the STEM disciplines, innovation in hands-on lessons and support of the school administration. Brinza, who's in her third year at Alcott and 11th in Chicago Public Schools, said that the support was never in doubt. "I am not a silo. I couldn't get where I am because of just me. There have been so many people in my career at CPS who have really motivated me to want more," she said. The award came with a $1,000 check, but also a $1,500 gift card to be spent on school supplies and other materials. Brinza said she's aggressive in applying for grants, like the one that provided the 3-D printer in her classroom. Brinza said it's all about making kids excited about learning and not fearful of failure. "There's a sign on my door that reads, 'Failure leads to success,'" she said. "There is so much reward in failure. It's OK to fail in my class. And I don't mean like in terms of the grade, but we make mistakes along the way to help us better understand what we've figured out. And that's vital in everything we do as adults. We learn from our mistakes." Of course, Brinza would probably be the first to allow that a good cup of coffee helps as well, if you want to consider that an integrated approach to teaching.